Welcome back to this week's Rosewood Roundup! You guys, we got so close last week to seeing Charles’ face and also managed to get even more clues. Let’s not waste any time and jump right in! Hanna and Ashley can’t seem to get ahold of Papa D., so they decide to go to his office and see what he knows about the scholarship money. Ashley doesn’t understand how it’s possible for it to be from Charles. “A gives so A can take away.” How doesn’t Ashley understand that that’s the name of the game by now? When they round the corner to enter his office, they see the doors swarmed by news stations and Ashley doesn’t want Hanna in the spotlight, so they decide to leave. Clark and Aria are chatting in the coffee shop with Ezra not-even-remotely-subtly lurking in the background. Seriously, it’s like he’s not even trying to hide. Clark rolls off a laundry list of questions about A and can’t seem to understand that Aria does not want to answer them. Since Aria isn’t allowed to go to the gallery for the photo contest, Clark gives her the invite that has her photo on the front. It’s sweet. I still don’t know what his deal is, but that was really sweet. Ezra strolls up literally the second Clark leaves and points out that he was asking far too many questions. Aria reminds him that he’s harmless, but as Ezra intelligently points out, “I’m suspicious of everyone these days.” (GOOD JOB, EZRA.) They talk briefly of the gallery and how her mother fears it’s a terrible idea and he offers to be her date in the event that it would get her there. She basically doesn’t hear him and says he gave her a better idea. He’s visibly sad and my little heart still misses the two of them together. Ali is at Lorenzo’s apartment and she tells him that her dad won’t talk to her and Jason since the arcade incident. Lorenzo says that “It must be hard to know that all of this has been your brother.” Ali seems really shaken up about Charles getting hurt and that’s really weird. He tried to kill her when she was a baby! Anyway, Lorenzo seems to be getting a little too close for comfort and he’s giving me a ton of weird vibes. Back at Aria’s house, Tanner is helping her convince Ella that it’s okay for the girls to go to the gallery. As she looks at Aria’s photos, she says, “You have an eye for detail, Aria.” (Sounds like another thing to add to the “Is Aria A?” column.) But it’s nice that Tanner is finally starting to work with the girls now that she no longer suspects them. But when the girls finally get the go ahead for the gallery, we see, as we all suspected, that Charles was watching the space. But it’s not just that, you guys! A buzzer sounds and he presses a red button letting someone in. Who is that someone? RED COAT. ARE YOU KIDDING ME? RED COAT?! Now we know that A is certainly not working alone and his accomplice is most certainly a girl. This is almost too much to handle. While Aria is getting ready for the night, Emily lets us all know that the girls will be there with her for her big night. Of course, with A watching, this feels like a colossally bad idea and I feel like this isn’t going to end well for anyone. Emily reaches into Aria's closet to grab a garment bag, and Aria says she can’t see it. It’s her prom dress. (For the record, I find it rude and inappropriate that I’m not allowed to see it.) Emily talks about her dress, too, and says that she hopes that they even get to wear them. Turns out the girls' parents all got an email saying that they may not be allowed to attend as many parents feel they will be endangering their children. “After all we’ve been through, we deserve to go.” TOO RIGHT, EMS. Spencer and Hanna go to the Carrisimi Group to do some recon. Hanna is automatically suspicious and tells Spencer not to speak as it could be bugged and the mirror could be two-way. Spencer thinks she’s absolutely nuts, but I mean, can you even blame Hanna at this point? Rhys Matthews comes into the room and looks eerily like a DiLaurentis. Ugh. Back at Lorenzo’s apartment, he tells Ali that her father is participating with the investigation and is in no way involving his attorney. This seems slightly fishy. Does he know more than he has lead us to believe? What else has he been hiding? He also says that Tanner has called in a profiler to fill in the blanks of what the cops have so far. Meanwhile, back at Aria’s, she and Emily are having normal, regular, everyday girl chat and it’s just so cute. They’re actually allowed to talk about normal things like Emily kissing Sarah and Aria not knowing what to do about prom, and I’m totally in love with this very rare moment. Aria asks if Sarah knows about the trackers and this is interesting to me. Emily says that she won’t tell her about them but shouldn’t she? Shouldn’t she also be worried about her being tracked? Does this mean that she might be the girl in the red coat? Especially seeing as how she wasn't in this episode and she mysteriously went "home" last week. And to add to it, Aria mentions how Clark had too many questions and basically admits to being thrown off by his need for answers. Why would she want to be interviewed? Something feels really off about that and it’s not sitting well with me. While the other girls are at the gallery supporting Aria, Ali swipes Lorenzo’s police ID card. Bad move, girl. Ugh. Hanna wonders if the Carrisimi Group isn’t “some elaborate black hoodie” and they aren’t sure whether to tell the others what they know, but Emily gets them to spill the beans. Hanna shows her the picture and Emily asks why she has a picture of Jason on her phone. When they tell her it’s a photo of Rhys, they’re all clearly thinking the same thing. Aria sees Ezra, who came up to support her, and be still my heart, okay? Call me crazy, but I really miss those two being together. She asks Ezra to go to prom with her and I’m sitting here like, “Isn’t that super weird? Like, aren’t there rules and age restrictions? And he was totally a teacher, so. No, Aria.” Before he can answer, Emily’s friend Nicole walks up to Ezra, and Aria sprints towards Clark to avoid her embarrassment. All I can think about when they’re talking is that something just isn’t adding up with him. When Aria asks if Clark has any family there to support him on his big night, he says he doesn't. “I didn’t want them [my parents] to feel obligated to come in case I didn’t win.” I sense a lie right there and it’s not even a good one. 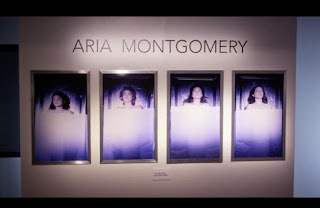 It’s time to reveal the contestants’ photos and when the lights come up, Aria’s display is front and center and they aren’t Aria’s photos; they’re the girls on the autopsy tables in the dollhouse. WHAT A BOMB. I didn’t see that one coming, that’s for sure. Of course, that shuts down the whole gallery, which has now become a crime scene. A has called the photos “Stolen Dolls” and Ella wonders where this will end. Tanner tells Ella and Aria that the rest of the title (in Spanish) has a double meaning and one of the meanings says that basically the girls aren’t Linda’s (hers). Ella wonders if Charles feels like Tanner took something from him when they rescued the girls from the dollhouse. She says that not only did A want to ruin Aria’s big night and exploit the girls, but to send her a personal message. “That he thinks we belong to him? We already knew that. We lived that.” Good point, Aria. Tanner says that Charles wanted to prove that the more she uncovered about his life, the more he could uncover about hers. Ella rightfully freaks out and wants to know when any of them are going to be safe. She’s irate that he made a display out of the girls and wanted everyone to see the control he has. He was there in that room and they still don’t have him. Tanner says that they’re dusting for fingerprints and they have security footage to review, but this is A, guys. Do we really think he’s going to leave a print? Or be on camera? Ella just wants to know when they’re going to find A, and I’m like dude, get in line. While Ali sneaks into an eerily empty precinct, everyone but Aria is outside waiting at the valet. They look across the street and oh, look who we have here! It’s Rhys Matthews! You just decided to casually roll up on this place and talk on your phone right outside where the girls are? Coincidence? I THINK NOT. He’s definitely playing some sort of role here. The girls get in the car and follow him to a weird factory and decide, for once, not to follow someone into a sketchy building. Good job. Meanwhile, Ali walks into the room in the precinct housing the A investigation and is surrounded by, as Spencer put it two episodes ago, “A’s greatest hits.” Of COURSE Tanner walks in and finds Ali where she’s not supposed to be. Tanner is obviously livid with Ali. No matter what Tanner says, Ali is still trying to find the good in Charles. Again, he tried to kill you when you were a baby, so you should take a step back and reevaluate, girl. She asks why Charles would have Ali’s things and though Ali wants to assume it’s to have something of the family that left him behind, Tanner says that maybe she’s not looking at it the right way. Sociopaths are just as easily as sentimental and will have anything that will give them hair or skin. Duh, of course the dude’s a sociopath. For Ali to think otherwise is totally bonkers to me. - “What will happen when you find him? Ezra comes out to talk to Aria and she apologizes for interrupting his date. He explains that it wasn’t a date and that he just wanted to learn more about what Aria was doing. Cool. Can we take the cuteness down a notch? Like, I’m not impressed if you two don’t get back together. The two wonder why A did what he did. “He’s so close to being caught. He has nothing to lose.” While that might be true, Aria thinks that it’s more that he wants the girls back and he’ll stop at nothing to prove that. For the first time, Aria really discusses her time in Iceland and how she thinks back to when she was there and how none of this could touch her. There, none of this could have happened. While it was freezing there, Aria hasn’t been able to feel anything but cold since she left. At the doll factory, another car rolls up and I think we’re about to see A’s accomplice BUT NO. Instead, who gets out of the car? CLARK. I TOLD YOU GUYS HE WASN’T RIGHT. There was something off about that that dude and him walking into that factory after Rhys just cements that. Ali is back at Lorenzo’s apartment and he’s also furious with her when he discovers what she did. She’s put his whole job in jeopardy but she doesn’t care. All she cares about is the fact that the police are going to kill Charles on sight once they see him. Again, WHY DOES THAT MATTER? I’m over Ali already. Ashley offers to make Ella tea, as she can see something is wrong with the woman. Ashley obviously doesn’t know what happened at the gallery. They discuss the girls not being able to go to prom and then Ella says that the police aren’t doing enough; that they have to figure something out... but what? As she tells Ashley what happened at the gallery, the shot pans out and RED COAT is standing there. Totally casual. NOT. Aria opens the door for the girls and no one wants to say anything. Finally, Emily says, “Your friend Clark. We’re not so sure he’s a friend.” They tell her what they saw as Tanner reviews the security footage and sees Rhys changing out Aria’s photographs. Would A be that careless and not hide his identity? Methinks not. We see the shot of a trunk and a bag of viles. You know, VILES OF DRUGS TO KNOCK THE GIRLS OUT. A gets in the backseat of a car, knocks on the window and Red Coat hands over an envelope with tickets to prom. So, wait. The girls are going to prom? Boy, this has been a whirlwind of a dance dilemma! We are only one more episode away from coming face to face with A on August 11th! From the previews, can we assume that A speaks to Alison directly? Could the girls be right? Could Rhys be Charles? Why would he take a meeting with two of them and give himself up like that? And why would he allow his face to be on security footage? Wouldn’t he take more precaution? Or is that actually Charles, and A is just someone pretending to be Charles? And who is Red Coat? It can’t possibly be Cece. I’m leaning more towards Sarah. What do you guys think? Let us know in the comments or over on twitter @MissMeganMann!